Dr. James Chalmers of Chalmers & Associates LLC of Billings, Montana answers questions from Attorney Tom Pappas, representing Counsel for the Public, during adjudicative hearings before the Site Evaluation Committee on the Northern Pass Transmission project Monday. 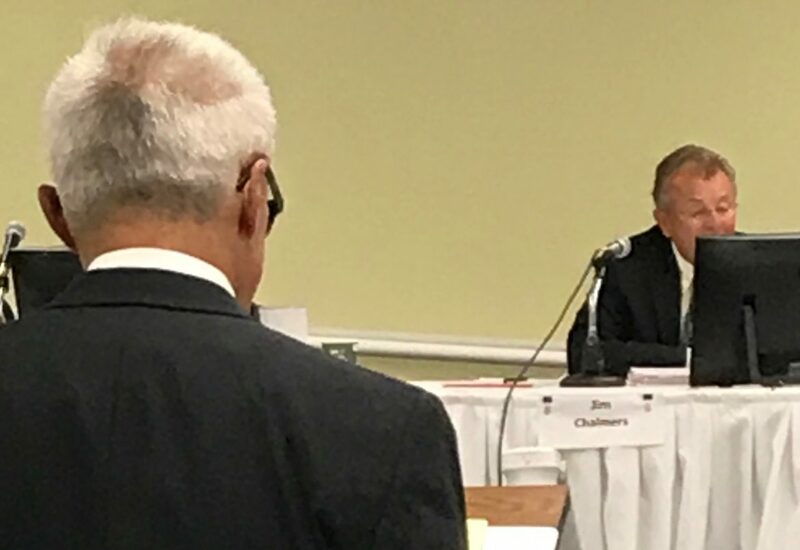 CONCORD — The validity of a report claiming little to no impact on property values from the Northern Pass Transmission project was questioned Monday before the Site Evaluation Committee. The report concludes the effects would be between a 1- and 6-percent decrease in values for properties abutting or encumbered by the line, but would dwindle rapidly with distance. Chalmers said he relied on the data and judgement of appraiser Brian Underwood for many of the 58 case studies used to reach his conclusion. Underwood of Rye and the former chair of the NH Real Estate Appraisers Board, did a 2012 study for Eversource, the developer of the proposed $1.6 billion, high-voltage transmission line from Pittsburg to Deerfield that concluded the project would not affect property values. Chalmers’ 2015 report “High-Voltage Transmission Lines and New Hampshire Real Estate Markets: A Research Report,” used 25 existing studies and data from 58 property sales in communities along three other New Hampshire transmission lines to determine property value impact. Underwood, who has since filed for bankruptcy, was one of three appraisers hired by Eversource to review the data and determine if the transmission lines decreased property values or increased the length of time before properties sold. Pappas asked Chalmers if he relied on Underwood’s accuracy, credibility and judgement in reaching his conclusion, and Chalmers said he did. Then Pappas asked if Chalmers knew Underwood had financial problems and filed for bankruptcy or of allegations he provided false testimony, and Chalmers said he did not. Underwood was the chair of the appraisers board when Northern Pass filed a complaint against North Country appraiser James Walker who told a Dalton couple the project would reduce the value of their 130-plus acre property by 63 percent. Northern Pass claimed Walker’s methods were suspect and the company had been unfairly harmed by the assessment. Walker filed an ethics complaint against Underwood, but dropped it as part of a settlement with the board. At the adjudicative hearing, Pappas noted Underwood found only four of the 28 case studies along the transmission line between Littleton and Pelham had decreased values with two other possible cases, but more than half sold for less than their appraised value and stayed on the market longer than the average in those towns. Many of the properties were more than 100 feet from the right-of-way, he noted, and wondered why the sample had been limited to those within 100 feet of the right-of-way. Chalmers said Underwood interviewed the brokers and reviewed other conditions to make his judgement. Chalmers also said it is very difficult to find similar properties that sold nearby to compare to the case studies. Pappas noted that other studies done by Chalmers show a negative impact of from 3- to 9-percent on properties up to 300 to 500 feet from right of ways, but Chalmers said he tried to do as thorough a review of possible to arrive at the 1- to 6-percent and within 100 feet guidelines. Chalmers said three things drive property values near transmission lines: proximity, visibility and encumbrance. Pappas said Chalmers’ work analyzes the impact of existing transmission lines, not a new transmission line like Northern Pass. But he said answering the question of the overall impact of transmission lines on property values is a foundation for establishing his opinion on Northern Pass. He noted the impact will only be on the homes close to the Northern Pass route where towers are not visible but will be after the project is constructed. Murray said to address potential impacts, Northern Pass developed the Guarantee Program, which would compensate property owners who could face an economic loss if they sell their property within five years of when construction begins. Hearings on the 1,090 megawatt transmission project to bring Hydro-Quebec electricity to New England continue Tuesday. The developers hope to complete permitting this year with the line operating in 2020. InDepthNH.org’s comprehensive coverage of the SEC hearings on Northern Pass. April 30: Is NH Getting ‘Hoodwinked’ on Health and Safety By Northern Pass?